Ahipara Tides is located in the small Far North Township of Ahipara. 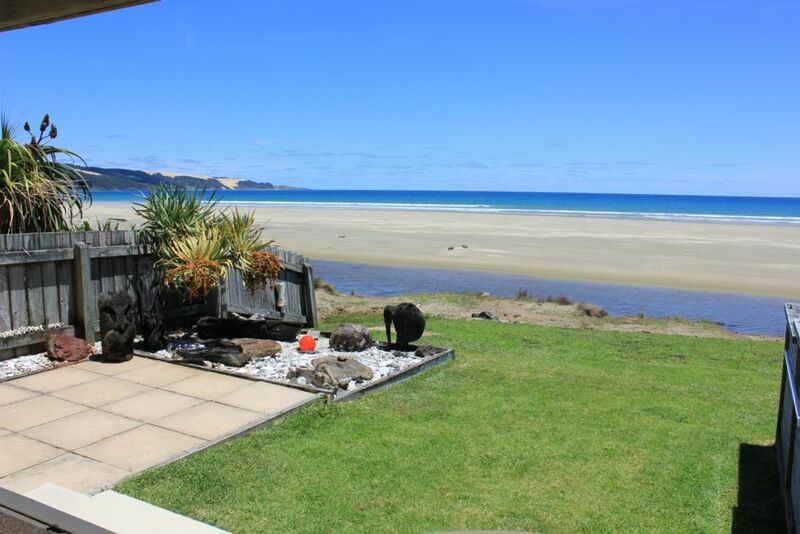 We offer absolute beachfront accommodation on Ninety Mile Beach, New Zealand. We are a beach front duplex and only provide one holiday accommodation for guests. We stay in the adjoining unit so you can be assured of your peace and privacy. As you can see our apartment is on the beach in a coastal paradise where the sun shines all day and the sea laps the shore. Ahipara is a magical place where the tide often rules your days and the beach goes on for well… 90 miles. WE VALUE OUR COMMUNITY, ENVIRONMENT AND THE NATIVE FLORA AND FAUNA, THEREFORE WE DO NOT ALLOW MOTOCROSS BIKES OR QUADS AT AHIPARA TIDES. The hot tub is located on our side of the property and is private on request. Your absolute privacy is assured. CENTRAL TO ALL ACTIVITIES, LOCALLY and NORTHLAND WIDE! 1)We provide a clean and tidy modern Beachfront unit with all the essentials. We ask that you treat the unit and all amenities with respect. 2)Reservations are for 1 or 2 people only using the queen bed in the bedroom. Additional fees apply for use of the sofa bed. 4)If you wish to have visitors please enquire. 5The spa pool is for the exclusive use of paying guests only. 6)Please do take or use any furniture outside. With so many activities in the area there's always somthing fun and exciting to look forward to. Great little spot with beautiful views. Great little spot with beautiful views. Everything you could need for a comfortable and relaxing beach break. We really enjoyed our stay and Doug and Jackie were very friendly and accommodating hosts. The property was immaculately kept,the location was perfect with a beautiful outlook across the beach and the ocean. Location is peaceful and you can just about touch the stars on a clear night. Location is peaceful and you can just about touch the stars on a clear night...magical place. Property is private and overlooks part of 90 mile beach. Stunning location! The beach is at your doorstep and this beautiful surf beach insists that you rest awhile at this beautiful fully equipped bach.